Ever feel you are too old, too slow, or not athletic enough to take on a fitness challenge? 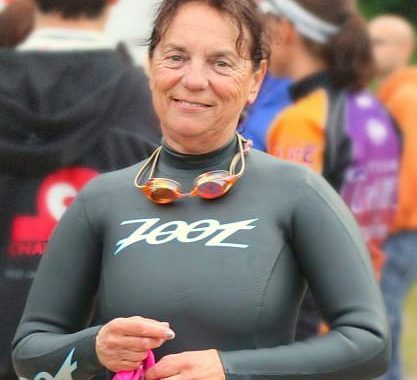 Meet this week’s over 50 athlete of the week, Terrie Wurzbacher, 66. She felt all of those things. 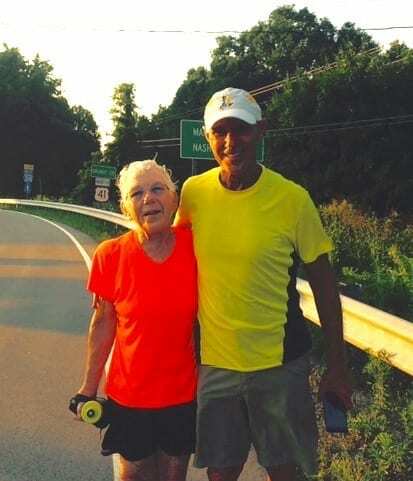 Despite these insecurities, two weeks ago, she became the oldest female runner to complete the Volunteer State 500k (314 miles) Road Race. Read her story. Terrie grew up in New York. From age four, she knew she wanted to be a doctor. To help with the high cost of medical school, she joined the Navy and began a 30 year career as a Navy Emergency Physician. She loved her work except one thing. Running for the annual physical fitness test. She detested running. Luckily, in the Navy, most years she could meet her fitness test by swimming instead of running. But when she had to run, the first thing she did when she was finished has reach for her coffee and cigarettes. Fast forward to Terrie’s mid-40s. After surgery, she wanted to return to one of her favorite pastimes – playing catcher in softball. Terrie decided to test things out by running a little bit. So she ran to the end of her block (1/3 of a mile.) The first day she cursed her decision. But by the end of the week, Terrie was shocked to find she loved to run! Terrie was a runner! 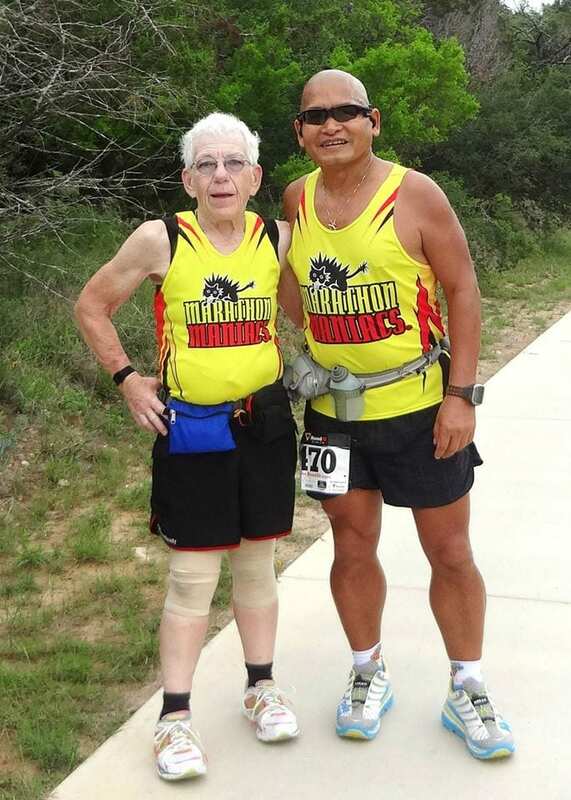 Terrie soon discovered her real passion was for long distance running. Shin splints that were incredibly painful in short runs miraculously disappeared after 30-45 minutes of running. So Terrie figured, why not run long? The year after completing that first 1/3 of a mile run, Terrie was toeing the line at the New York City Marathon. And if a marathon is fun, why not an ultramarathon? Terrie liked the low key, supportive atmosphere of ultramarathons, which are typically run on trails. 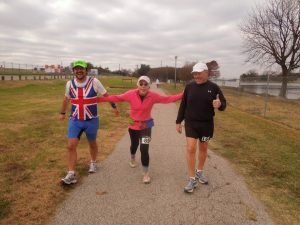 Only a little more than two years after running that first 1/3 of a mile, Terrie completed two 50 mile ultra marathons! And with her new found passion for running, Terrie quit smoking, after 24 years of a 3-4 pack a day habit. Terrie is not much of a numbers keeper, but she has run more than 35 marathon plus distance races since she began running in her mid-40s. Terrie had a long hiatus from running, as work and weight gain sidelined her. She retired from the Navy in 2004, and began working in the Army Disability System. After the death of one of her colleagues, she quickly became mired in the tremendous work burden that continued to escalate as the war in Iraq and Afghanistan continued and then wound down. When she was stationed in San Antonio, she was introduced to Dr. Anne Kunath, ordained minister, doctor of divinity, and a well known author, lecturer and speaker. Terrie learned about the idea of oneness in the Universe and how thoughts, feelings and expressions influence what happens to us. Terrie was drawn to learning more and exploring this philosophy. Terrie began to apply those tools to her own life, and in 2011 she realized that spending all her time at work was preventing her from enjoying life – or from even finding out what life really was. So she set about to change that. She began taking control of her work life. And as Terrie says, “some things take root inside you and grow over time.” Running had taken root. It was time to let it grow again. 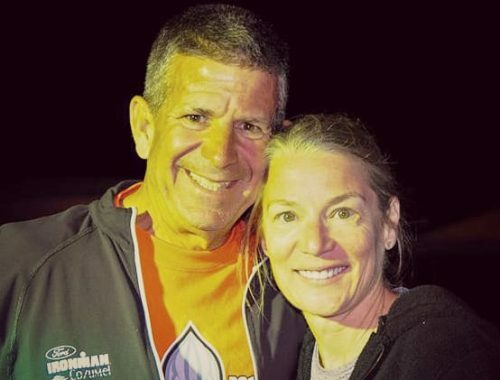 When Terrie started running ultramarathons, she had tried, but not finished, a 100 miler. 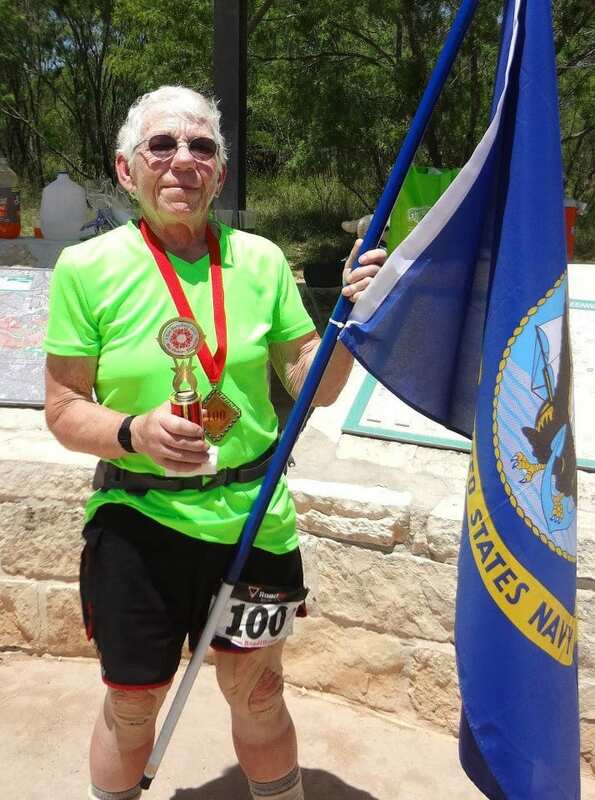 At age 63, Terrie completed her first 100 mile ultra marathon! 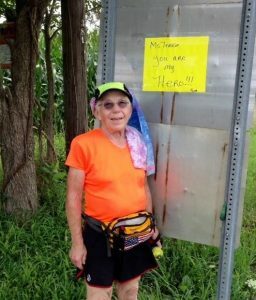 Because Terrie is a slower runner, it could be difficult to meet the time cut offs for many ultramarathons. 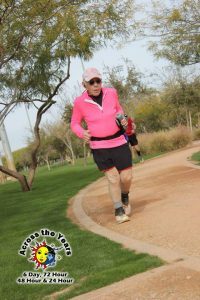 So Terrie began to explore multiday events, many of which involve running for a period of time, rather than covering a particular distance. 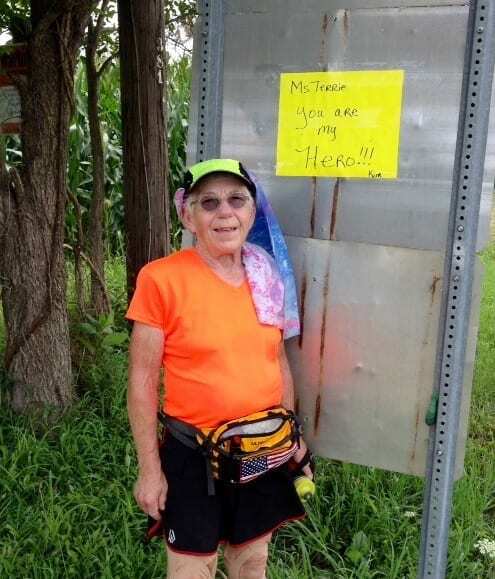 Terrie first completed a 72 hour ultra, then a six day ultra. 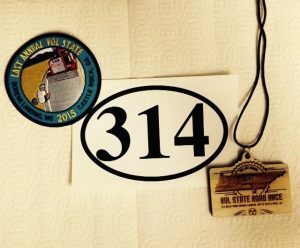 She became fascinated with the Volunteer State 500k. Last year, she gave it a try. But overtraining in advance of the race left her unable to finish. She withdrew after 104 miles. She had unfinished business and decided she would come back and try again. The Vol-State typically begins in Missouri, just across the Mississippi River from Kentucky, crosses Tennessee and finishes at “the Rock,” high atop Sand Mountain in Northeast Georgia. What lies in between are 314 miles of the great unknown. Heat, hills, traffic and humidity in the middle of the summer in the south. And ten days to finish. Before the race, it seemed as if the odds were stacked against Terrie. She tried a popular 30 day nutrition program in early 2015. Unfortunately, Terrie ended up with a medical condition that required major abdominal surgery in March. After surgery, Terrie was able to walk, but not run, for six weeks. 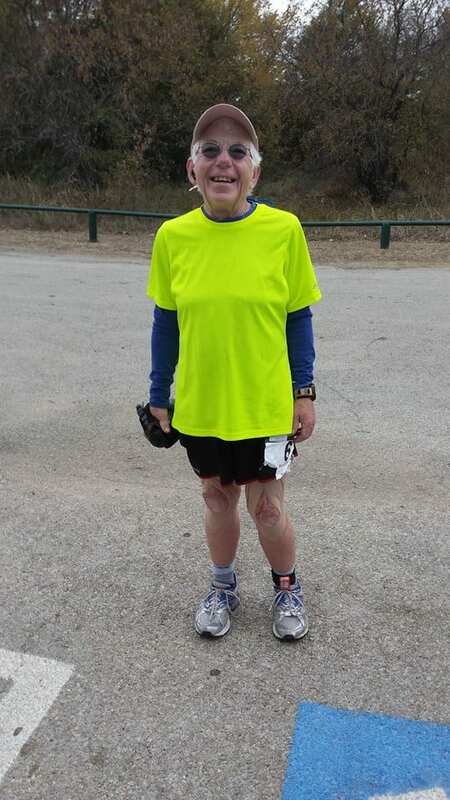 When she started running again, Terrie developed bursitis in her heel. Things didn’t get better once she started. Terrie suffered from diarrhea. Her GI tract was still sensitive and she had limited choices for things she could eat and continue the race. Five days into the journey, more things started breaking down. No matter what Terrie and her team did to make it better, Terrie experienced 4 ½ days of agonizing foot pain with every step. When she stopped, it took 10 minutes to be able to walk in some “ok” type of form again. And when Terrie stayed in a motel, she had to crawl to the bathroom it hurt so much to walk. Her right ankle began to hurt. Her hands, legs and feet began to swell. Terrie cried. She hurt. She faced doubt upon doubt. She wanted to quit. But she didn’t. She finished. 9 days, 21 hrs, 30 mins, 07 secs. Less than three hours before the 10 day cut-off time. 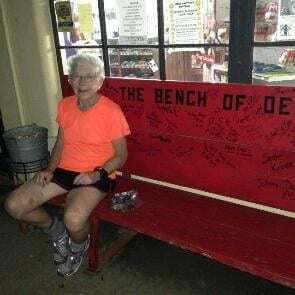 The oldest female finisher of Vol-State. Appreciation for My Ultra Family. 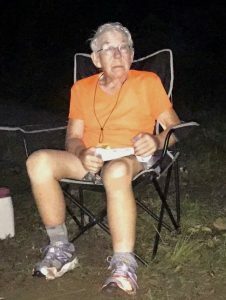 “I saw the camaraderie of all the folks in the ultrarunning world! Everyone is a family and is cheering each other on no matter what place they are in the race. 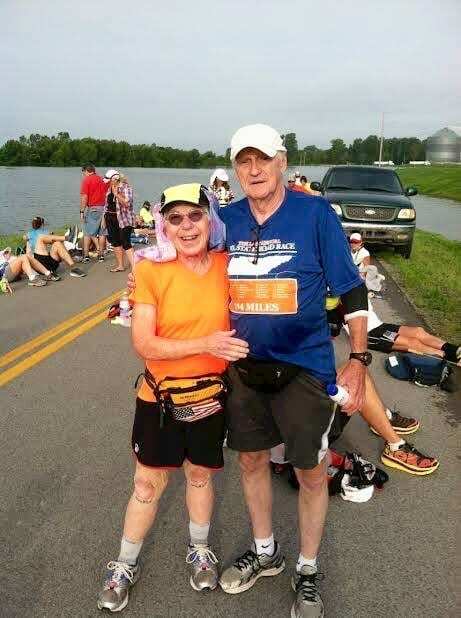 No one wants to see another person suffer and will do whatever they can to help people along the way, even if it means slowing them down.” Not to mention Terrie’s crew and friends! Don’t let your brain tell you what you can’t do. Use your thoughts to set goals and make a plan. If I can do it, you can too. I’m not blessed with some special athletic ability. Hard work and determination are all that is needed! What’s Up Next For Terrie? Terrie’s dream – to run across America! In the short term, you can look for her at a Race for the Ages in September (if she can walk again by then! ), the New York City Marathon, Ultra Centric and Across the Years. And perhaps another run at Vol-State – this time, solo and without a crew! Follow Terrie and her blog at Getting Unstuck.